At the far right is a thing of joy – unless you’re a West Coast Conference coach planning for the Zags. Under “average points,” the only player in double figures is forward Zykera Rice, at 13.4 points a game. No one else is in double figures, but five players – Chandler Smith, Jill Townsend, Jenn Wirth, Laura Stockton and Campbell – are averaging between eight and 10 points a game. The rebounding stats are even more startling for their balance. Rice leads the way with 6.2, but Smith, Werth and Townsend each average five or more. Skeptics would point to the lack of a go-to player. “Actually, we have a lot of them,” Campbell said. Along with sheer talent, balance is one of the biggest reasons GU is a program-best 21-2 and ranked 13th in the nation going into Saturday’s WCC game at Portland. Last year and the season before, Jill Barta dominated the stat sheet at GU. Both years she averaged half-again as many points as any other player. Along with Emma Stach, she also dominated the long-range shooting stats. Their departures forced some adaptation in the off-season. While Rice has asserted herself inside, Jenn and Lee Anne Wirth have grown into the game. Campbell – the fifth-best long-range shooter in the country – has made their job easier, and Townsend and Jessie Loera also are finding the range. As usual, senior guards Stockton and Smith are doing a little of everything. In the last four games, Smith has averaged seven rebounds. Stockton is making everyone better, totaling 28 assists in the last four contests. “This is the best team I’ve been a part of, for sure,” Stockton said recently. And she said “team” in the truest sense of the word. 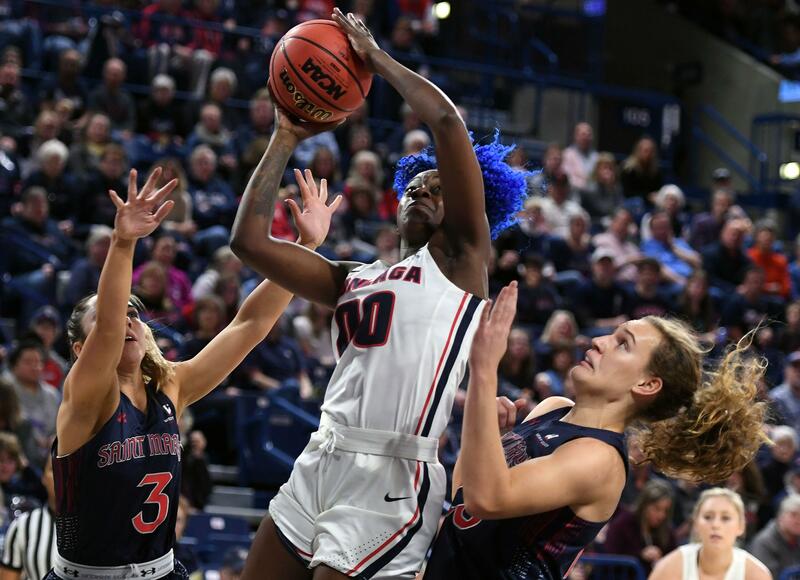 Deep, talented and closing in on another WCC regular-season title, the Zags are in first place at 10-1 and two games up on BYU in the loss column. GU closes out a three-game trip a game that looks like a mismatch. The Pilots were a program-best 8-3 in nonconference games but are sitting in ninth place in the WCC with a 2-9 mark. GU won the first meeting 97-71 on Jan. 12 in Spokane, their 36th win over Portland in the last 37 meetings. The Zags are dominating on defense, especially against WCC opponents. In the last five games, Gonzaga has limited its opponent to 55.2 points per game while forcing three of the last five opponents to shoot less than 37 percent. The Zags are back home Thursday against San Diego. Published: Feb. 8, 2019, 4:13 p.m. Updated: Feb. 8, 2019, 4:27 p.m.